The muppet wedding/honeymoon has been nominated for a 2011 new england arts award! MUPPET SID & MUPPET SARA WANT YOUR VOTE! the "Muppet Wedding/Honeymoon" video has been nominated for a 2011 New England Art Award!! The 2011 New England Art Awards is a contest to honor the best art made in New England, local writing about local art, and exhibits of New England art organized in 2011. Artist Juniper Friedman of Massachusetts; Daniel Fuller, director of the Institute of Contemporary Art at Maine College of Art; Liz O’Connell of Massachusetts, Tabitha Piseno of R.K. Projects in Rhode Island ranked their top six picks in each category from hundreds of nominations. The final ballot features the top votes in each category from each of these advisers plus The New England Journal of Aesthetic Research. Winners will be announced at the 2011 New England Art Awards Ball at 7 p.m. Thursday, March 1, 2012, at the Burren, 247 Elm St., Davis Square, Somerville, Massachusetts. ABOUT: The 2011 New England Art Awards is a contest to honor the best art made here, local writing about local art, and exhibits of New England art organized here in 2011. And we want you to help us pick the winners by voting via the online ballot here. Everyone is welcome to vote here. Winners will be chosen by (1) local active art writers and (2) anyone else who wants to vote – and will be announced in terms of these two categories of voters. You must follow that link above to vote. Votes submitted as comments will be ignored. Winners will be announced at the 2011 New England Art Awards Ball at 7 p.m. Thursday, March 1, 2012, at the Burren, 247 Elm St., Davis Square, Somerville, Massachusetts. The event is free and open to all. Dress creatively! Dress to impress! Entertainment will probably include a marching band, plus surprises! How to vote: Voting is automated – and our robots are standing by to receive your picks. You are welcome to vote in as many categories as you like or to leave lots of blanks. Please invite your friends to vote too. Votes must be submitted by 11:59 p.m. Friday, Feb. 24, to be counted. 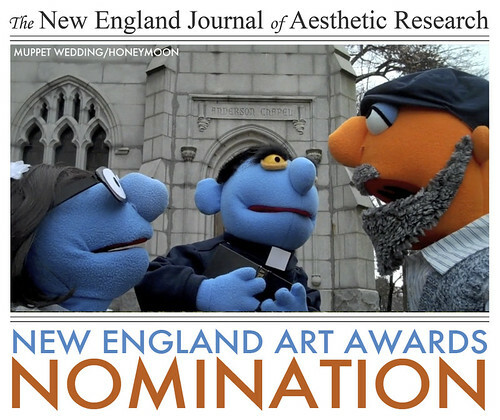 The New England Journal of Aesthetic Research will tally the votes. Nominees with the most votes in each category will win. Voting will only be accepted via the robot voting form. We ask each voter to submit a name and e-mail address to prevent fraud. Cheaters will be banished. If you spot factual errors in the ballot, please send us corrections. The aim of the awards, which are organized by The New England Journal of Aesthetic Research, is to promote a more exciting local art scene by encouraging and celebrating the work of artists, curators and art writers active in New England (except Yalies). What’s happened so far: The New England Journal of Aesthetic Research invited everyone to make nominations in January and around 500 things were nominated. (Thank you.) We asked readers to volunteer to help us cull the nominations and recruited a couple more folks to pitch in. This team – artist Juniper Friedman of Massachusetts; Daniel Fuller, director of the Institute of Contemporary Art at Maine College of Art; Liz O’Connell of Massachusetts, Tabitha Piseno of R.K. Projects in Rhode Island (thank you) – ranked their top six picks in each category. The final ballot features the top vote getters in each category from each of these advisors plus The New England Journal of Aesthetic Research, with us breaking ties as necessary. (Note: These kind folks were not allowed to vote for themselves or their institutions.) Some nominees were disqualified because they did not follow the guidelines requiring all nominees to feature art made and shared in New England—for example: the artist did not reside in New England, the art was not exhibited in New England in 2011, or, in the case of curators and art writers, the subject was not art made in New England, etc.